“How can technology and innovation make an impact on enhancing dementia care?” That was the question for a panel at the HealthXL Global Gathering, held October 4th, 2018 at the offices of GE Ventures, in the heart of the venture capital community on Sand Hill Road in Menlo Park. Rajiv Mehta, CEO of Atlas of Caregiving, was invited to give a short talk to kick-off the panel discussion. 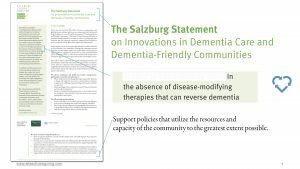 He noted how lessons learned in the world of quality management can be applied to dementia care. Hello. 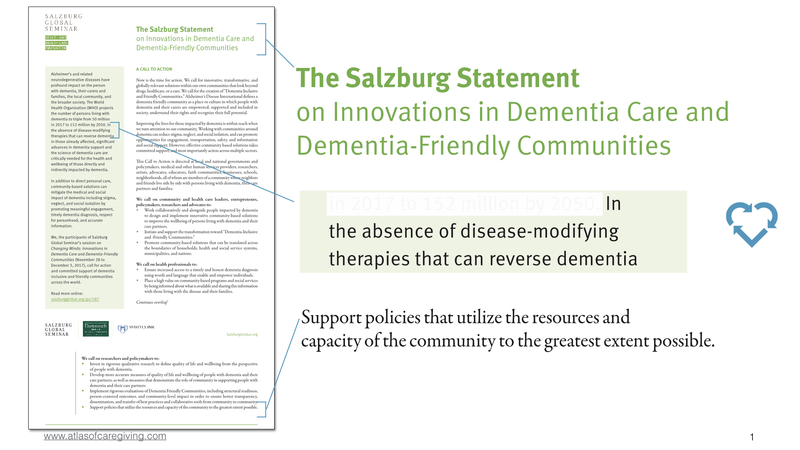 I was involved in drafting a recent Salzburg Statement on dementia-friendly communities. It acknowledges that currently medicine has little to offer, and urges a focus on “utilizing the resources and capacity of the community to the greatest extent possible”. 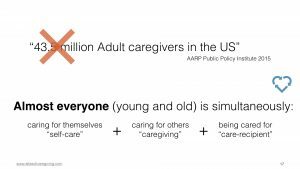 How can we best “lend a helping hand” to families and communities dealing with dementia? I’ll argue that our primary emphasis should be on fully leveraging community expertise, and NOT on health professionals. 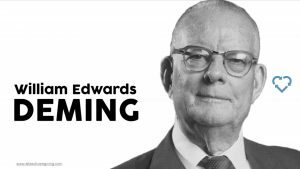 We can learn from Deming, an American statistician especially famous for his work on achieving quality. He taught us that the people most likely to improve a situation are those closest to it, the workers themselves. 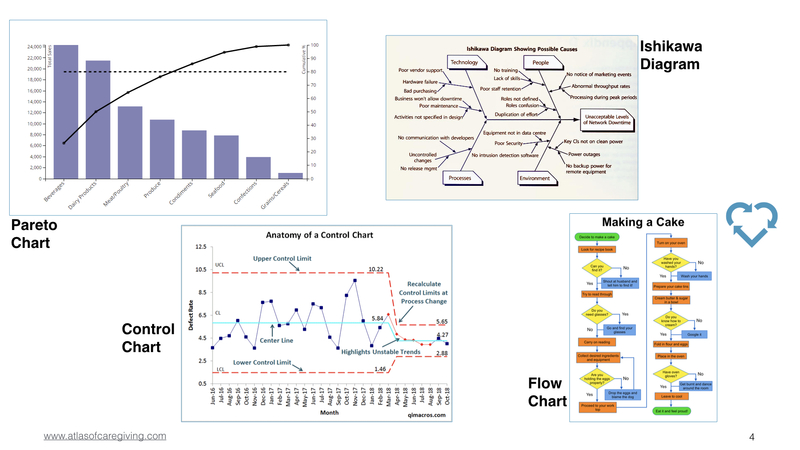 He emphasized the importance of tools for measurement and data analysis. Tools meant primarily FOR those workers. 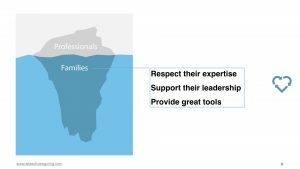 Only they, not distant experts, have the tacit knowledge for interpretation and action. In health, who are those workers? Imagine an iceberg. 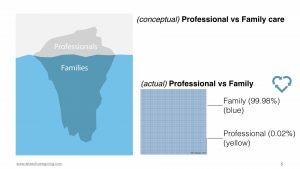 The visible portion is professional healthcare, but the vast hidden portion is family care. In reality, families do 99% of the work. 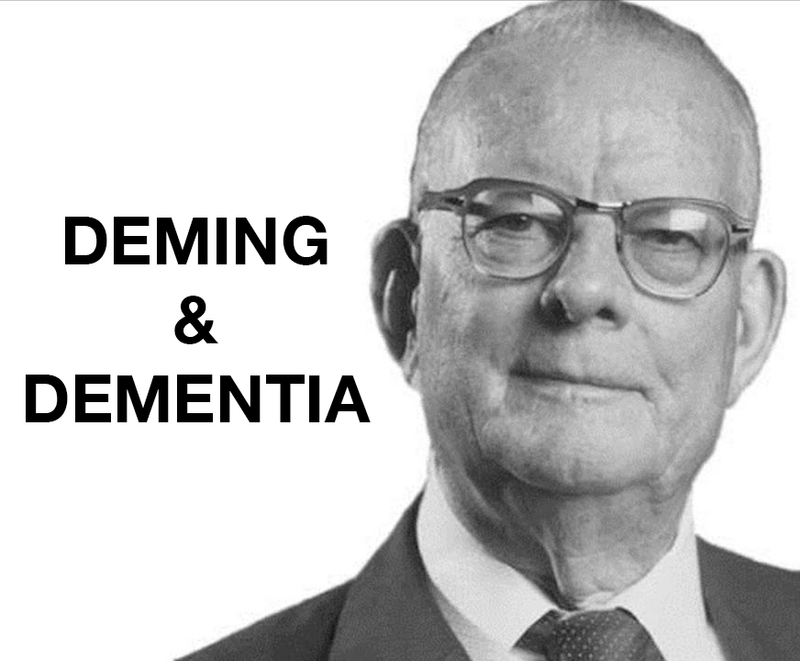 We need to heed Deming’s lesson for supporting families and communities dealing with dementia. 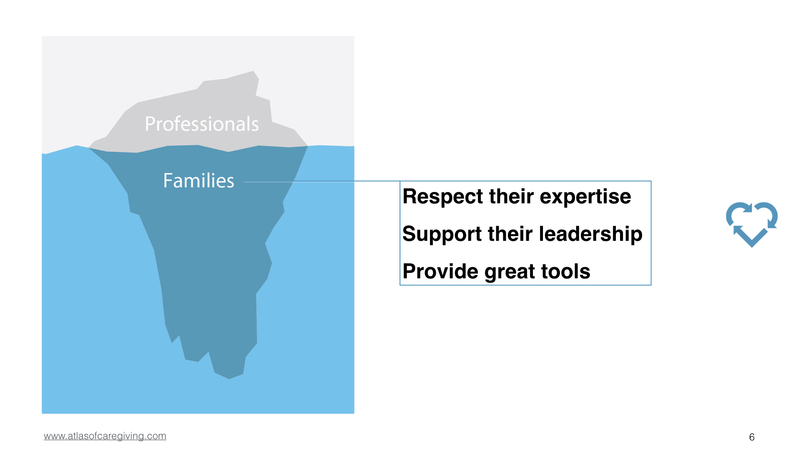 Our job is to respect their expertise, support their leadership, and provide great tools. Atlas of Caregiving has been developing new methods, combining anthropology and technology, to study and gather data on the actual, lived reality of day-to-day, even minute-to-minute, family care. 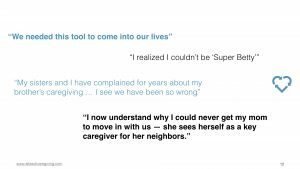 As appropriate, we have been turning these research methods into “practical tools” that anyone can use to better understand and manage their own caregiving situations. Let me tell you about three of them. 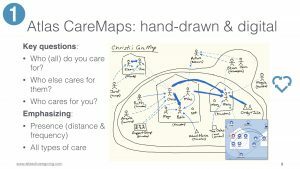 The one with the most traction is the Atlas CareMap, a way of thinking about and depicting a family’s care ecosystem. 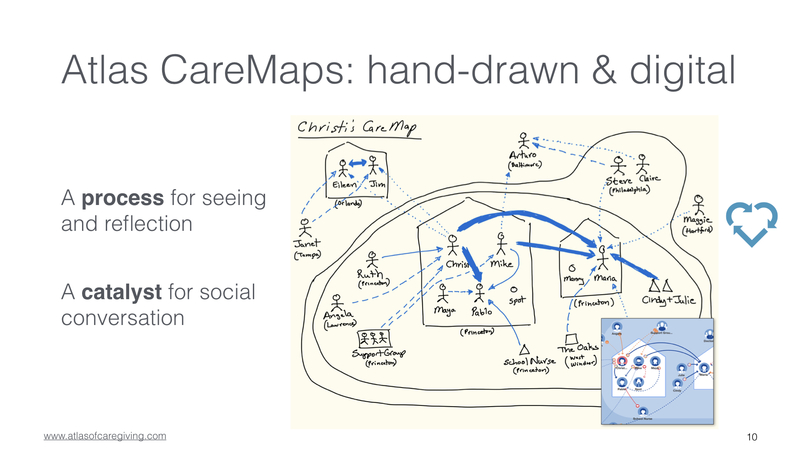 Hand-drawn or digital, it shows the web of care — who is involved, and what they do. This is NOT a tool for instant results. 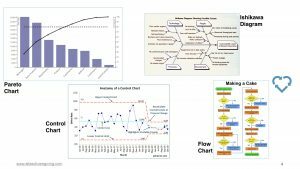 Not just a “gap analysis” to identify required services. 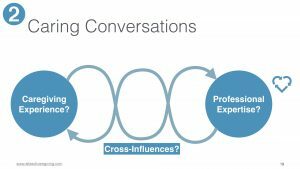 It’s power is in the slow and on-going process of self-reflection, and the social conversations it sparks. 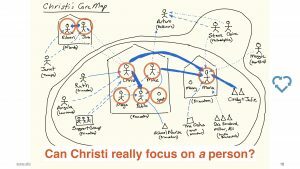 Though it may superficially resemble familiar concepts — ecograms, genograms, and such — for today, you’ll have to accept my word that it is different in fundamentally important ways. In the past three years, thousands of people have learned to draw Atlas CareMaps. Almost always they have gained new perspective on their situations. Some have described it as life changing. 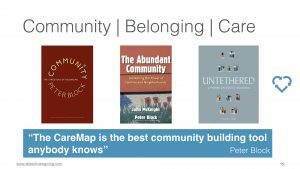 Many have learned through Atlas-led CareMap Workshops, during which people mainly learn from each other. 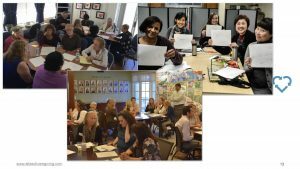 The Workshop opens their eyes to the value — emotional and practical — of social conversation about care. 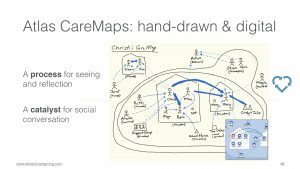 When carefully nurtured, this has resulted in people talking openly about care, and using CareMaps in all sorts of human situations. 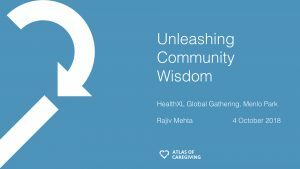 Through sharing experiences people learn a lot from each other — we call it Unleashing Community Wisdom. 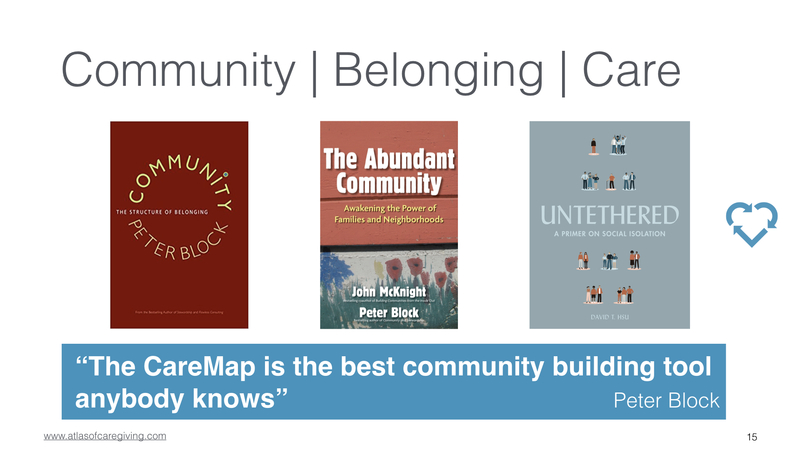 People focused on building community or concerned about today’s lack of community, are excited about CareMaps as a catalyst for change, by helping people see and appreciate the interconnected nature of our lives, to see the communities within which we exist. We are working with organizations to strengthen their communities across the human experience — for dementia care and elder care, of course, but also for youth and young adults and so on. 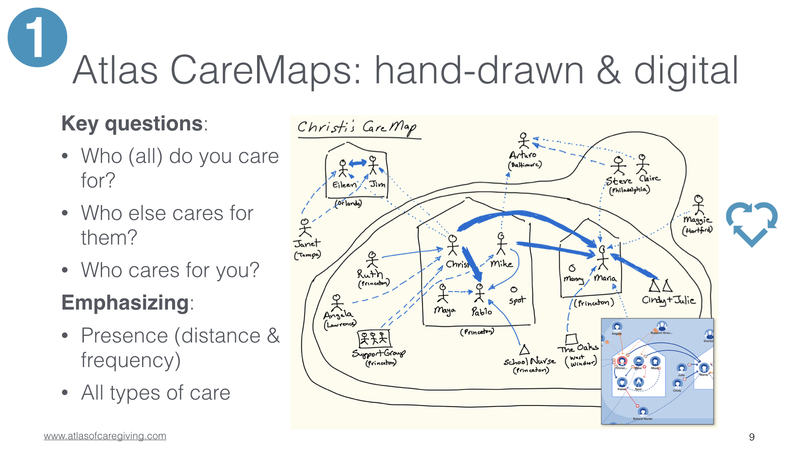 Something that becomes blatantly obvious as you draw CareMaps is that almost everyone is simultaneously caring for themselves, caring for others, and being cared for. Pretending otherwise leads to solutions that cause more harm than good. Also, as you appreciate the web of care, you realize that it is nonsensical to expect a family to focus on the wellbeing of one person — to support the community, you must support the whole community. 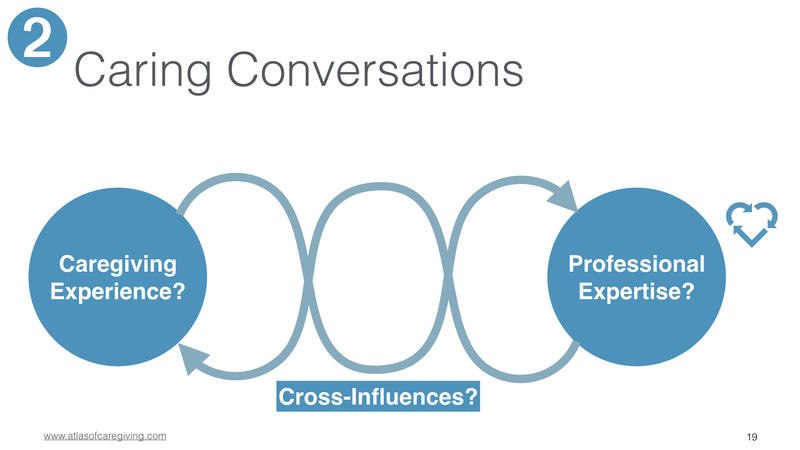 Another idea for sparking peer-to-peer learning is a template for a Caring Conversation, which helps people see how their field of expertise (no matter what it is) influences their caregiving, and vice versa. 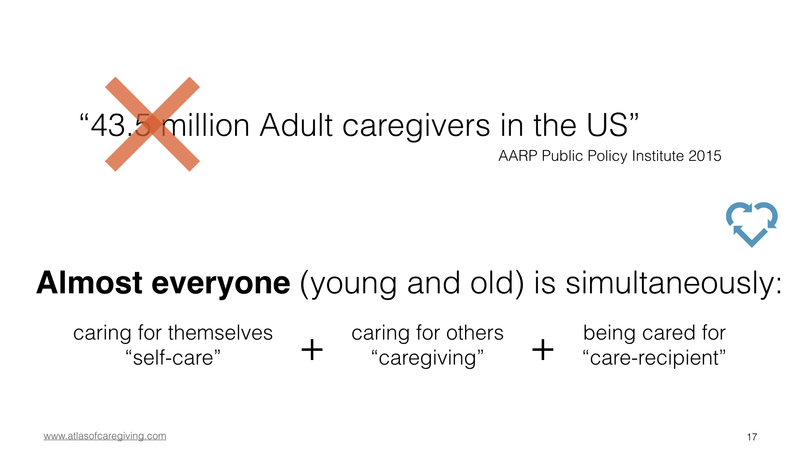 Caring is a universal activity, a fundamental part of the human experience. 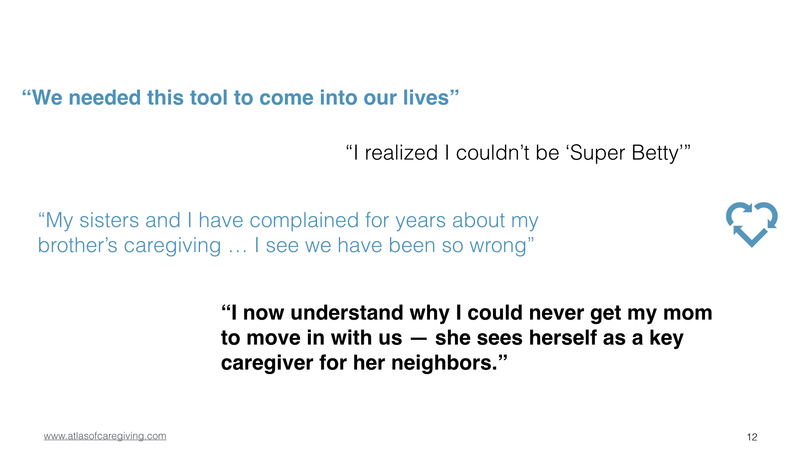 It impacts and is impacted by everything, not just medicine. Rather than hide from this complexity, we should mine this rich experience. 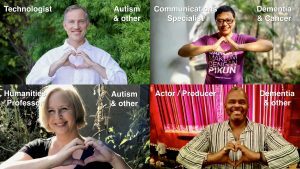 So far we have published about a dozen interviews. 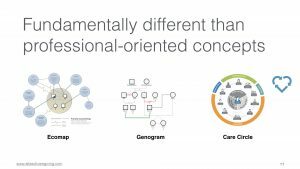 These demonstrate that we have so much to learn from artists and technologists, business consultants and english professors, and so on. 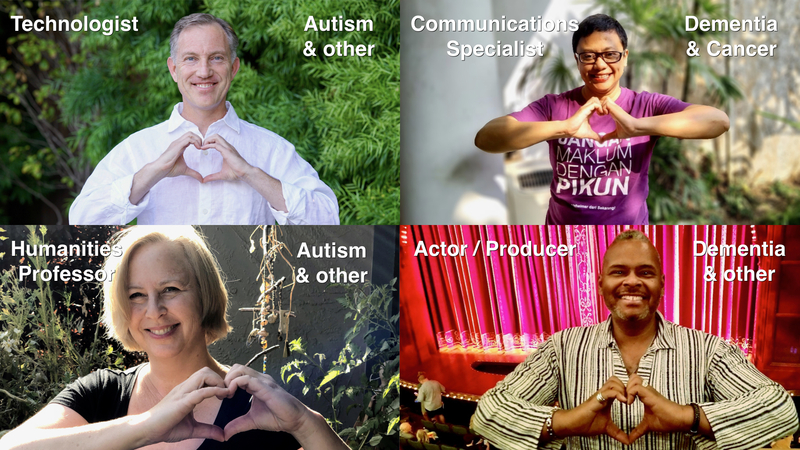 Through the process of the interview, every one of our interviewees learned something about themselves. 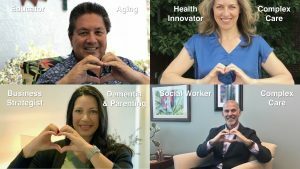 They were often surprised to discover how valuable their non-medical expertise had been for their caring efforts. We are exploring ways to help families and communities hold such conversations, and learn from each other. 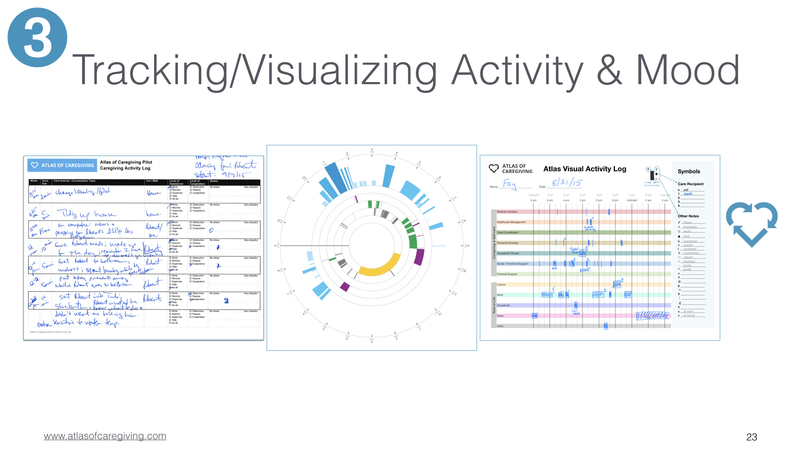 Still being refined is a tool for tracking and visualizing daily activities, moods and emotions. 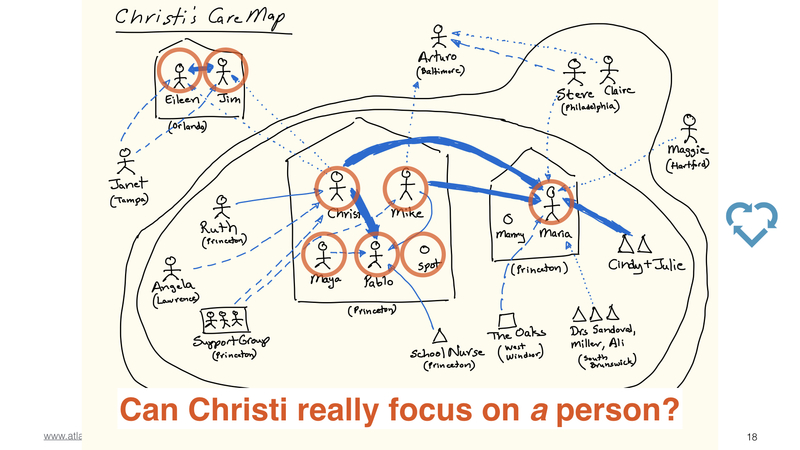 We have experimented with logs and diagrams, and logging-as-a-diagram. 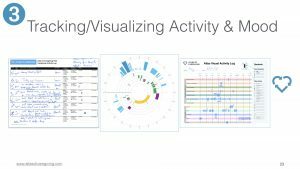 Everyone who has used these tools has had their eyes opened to their own day-to-day realities. 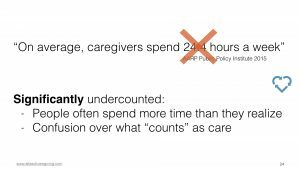 Our work has also shown how today’s survey-based knowledge of care activities is deeply flawed. I’ll wrap up with a few key points. 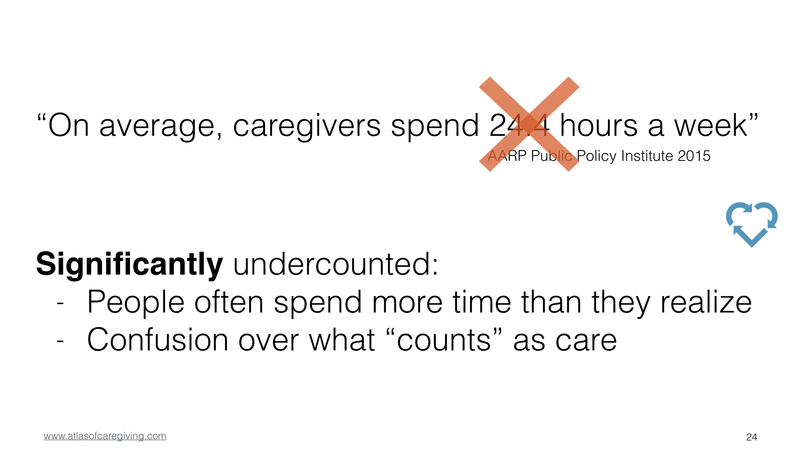 First, recognize that families are doing almost all of the work of care. 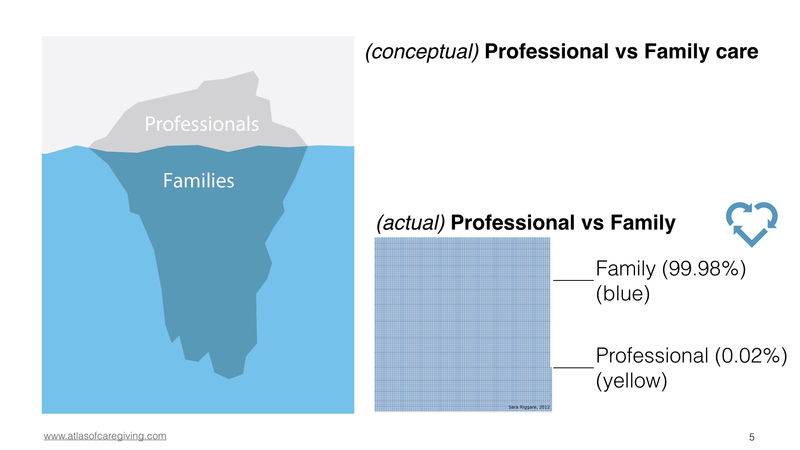 The bulk of our efforts should be aimed at families, not at professionals. 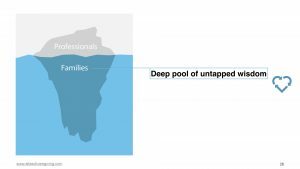 Second, recognize that there is a deep pool of untapped wisdom. 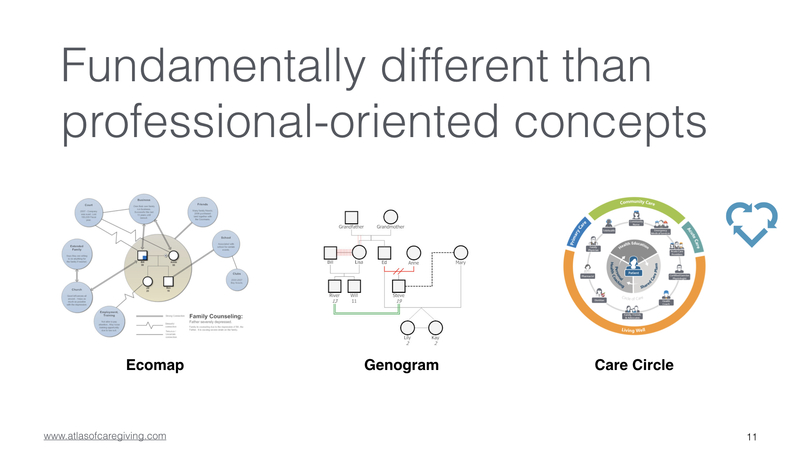 We need to appreciate the variety and depth of this knowledge. We must strive to unleash community wisdom. 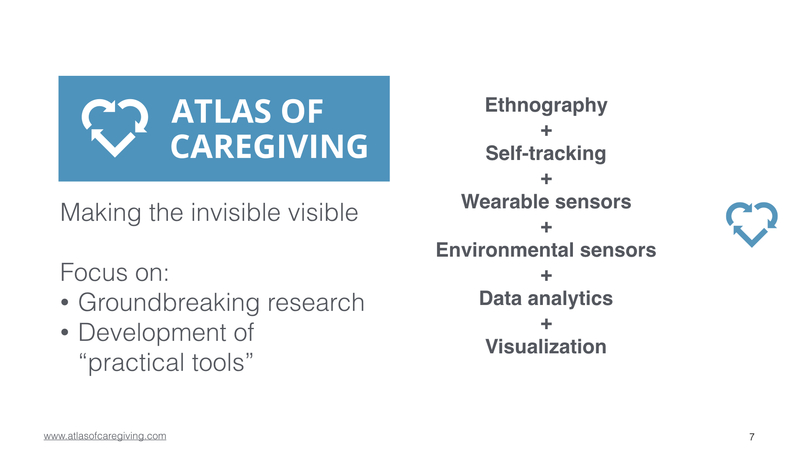 Third, there is enormous potential to develop and deploy tools to help people better understand and manage care. But, the world of family care is diverse and fluid — don’t underestimate the effort required to create powerful but easy-to-use tools. If you really want to mitigate the impact of dementia on society, I urge you to heed Deming’s counsel, and empower those closest to the action to take the lead.